Astaxanthin is a member of the carotenoid family and one of the most powerful antioxidants produced as a by-product in marine algae. When consumed by krill, crustaceans and other animals it gives them the characteristic reddish pink tint. As the compound works its way further up the food chain, the color becomes even more concentrated, providing the amazing shades of pinks and reds we commonly associate with salmon and flamingos. Since astaxanthin is something that occurs naturally in foods, which have been consumed for more than millennia, and is not a synthetically produced drug, it is fair to assume that it is safe. However, no safe upper limits for the dosage the body can tolerate, have yet been set. What is known, is that astaxanthin collects in one’s system and its advantages are heightened by taking it on a regular basis. According to one study the consumption of 6 milligrams daily for a protracted amount of time did not adversely affect any human blood parameters. In fact it is a dose that improves blood rheology (1). One human study registered no side effects when 21.6 mg were consumed daily, for two weeks or 20 mg were consumed for twelve weeks. Additionally, a single dose of 48 milligrams has also been tolerated well, with the only side effect of astaxanthin being the red coloration of feces! While on its own, this is not an issue medically speaking, it can be confused for colonic bleeding. In different human clinical studies conducted to investigate astaxanthin’s effect on different health related issues, doses ranging from 1.8 mg to 100 mg per day, taken as single dose to daily consumption for a period of one year, were proven safe. 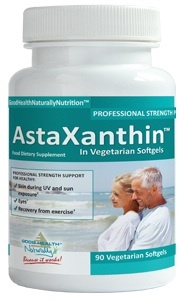 The health benefits of astaxanthin provide muscle, joint and connective tissue support. It can help fend against free-radicals that are strong enough to affect the lungs, kidneys and liver. Astaxanthin can also protect the skin, by adding an ultra-violet blocking layer, which also helps reduce wrinkles by improving moisture absorption factors. Around 20 milligrams per day is considered to be a good dose for athletes who experience heavy oxidative stress, or individuals with excessive sunlight exposure and pilots facing elevated levels of ionizing radiation. For other people doses between 10 to 16 mg are sufficient. People who want to take astaxanthin for specific health related problems like arthritis or Carpal Tunnel Syndrome, may wish to start with the higher dose, since it accumulates in the body, but then eventually taper off for best results. 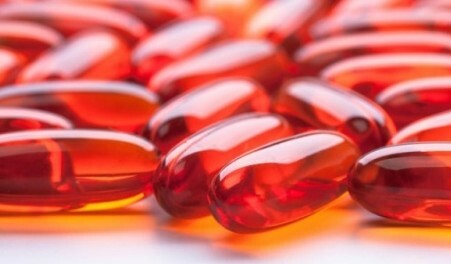 You can obtain astaxanthin (as a supplement) on its own, but be careful not to buy pharmaceutically produced versions. Or you can choose krill oil, of which astaxanthin is an ingredient, but no where near the recommended dosage of it, in krill oil. Always choose natural resources like krill oil, never synthetic. 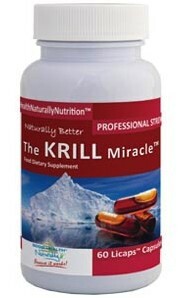 Plus, the health benefits of krill oil are almost endless, which you can read about on this site. The omega-3's it contains are the most suited source for the human body, as it is able to use more, without wasting any, unlike the omega-3's in fish oil.